Hub by Ekko lets you create a hi-res multi-room system | What Hi-Fi? 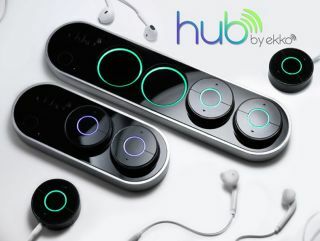 The Hub by Ekko is described as the “first hi-fi, wi-fi audio hub for headphones and speakers”. Comprising four ‘pucks’, which charge wirelessy on a central pod, the Hub connects to any audio source such as a TV, computer, mobile device or music streaming service, and also supports DLNA and AirPlay wireless streaming. Audio is then sent to the pucks, each of which has its own personal volume and mute settings. You can either plug a pair of headphones into the puck's 3.5mm jack or connect them to powered speakers or a hi-fi system, in a similar way to Chromecast Audio. Where the Ekko system differs though, is that it supports 24-bit/96kHz hi-res audio. Tidal is also supported to take full advantage. The Hub connects to a wi-fi router, but creates its own ultra-low latency network to transmit audio to the pucks and avoid interference. Pucks can be plugged into various devices around the home to create a multi-room system and the volume and equaliser settings of each can be controlled via an accompanying app. It’s likely the same song would have to be played through each puck as the source only goes into the hub. The Hub by Ekko is currently on Kickstarter, where it has surpassed its $100,000 goal. Ekko is also looking to add aptX HD support, provided there are no delays in production. You can pre-order a Hub Mini (with two pucks) for $159 or a Hub (four pucks) for $229, with delivery expected in July 2017.